The shoppers on Reykjavik's tranquil high street can't afford to do much more than window shop at the moment - with interest rates at 15%, and inflation at 14%, times were already hard. This week, the nationalisation of Iceland's third-biggest bank, Glitnir, only added to the sense of meltdown. "We were all surprised when we woke up and heard the news about Glitnir. No-one thought it would get that bad," says a woman outside a paper shop. An older man, leading his granddaughter, chirped in. "I was saving for a pension. My account is not with Glitnir, but I think the other banks are in just as bad a state. This will affect my standard of living," he says. Outside Glitnir's headquarters in Reykjavik, all is calm. But the biggest shareholder, billionaire tycoon Jon Johansson, was furious at the government takeover. "This is a huge shock for any company, no matter how large or small, its assets are forced down," he said. "This is the biggest bank robbery in Icelandic history. This need not have happened and we are seeing the results today: belief in the Icelandic currency has evaporated." Mr Johansson has insisted that his empire of British chain-stores is safe, but there are doubts. Iceland's second- largest bank, Landsbanki, was forced to sell off some of its assets this week. Its chairman owns West Ham football club and more than 150,000 British customers bank at its UK subsidiary, Icesave. And in the stuccoed chamber of Reykjavik's tiny 19th century Parliament building last night, the Prime Minister warned that the Glitnir bail-out would not end Iceland's banking crisis. 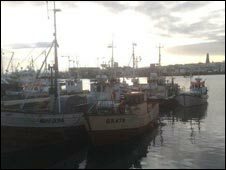 In the last decade Iceland has transformed from a minor economy based on fishing into a centre for aggressive banks with overseas assets worth nine times the country's GDP. The country's credit rating was slashed after the Glitnir nationalisation. The Icelandic krona, which had lost more than half its value since last summer, lost a further 14% this week. The government is openly divided on whether to keep the currency or ditch it - and adopt the euro. There's a growing sense that this country, with just 300,000 people, is too small to cope. Sigurdur Kristjanson, an MP from the prime minister's party, disagrees. "I think that's the atmosphere at this moment of banking crisis. But in the future when we have solved it, people will think differently. We should defend our currency." But the business lobby is putting increasing pressure on the government to act. "The current turmoil illuminates the need for a small, micro-economy, internationalised as Iceland is, to join a larger monetary union," says Jon Sigurrdson, CEO of Ossur, a world leader in manufacturing artificial and bionic limbs. In response to Iceland's growing difficulties, his company began offering staff the option of being paid in euros or dollars at the beginning of the year - effectively abandoning the krona. It's a bold step. But other businessmen share his views. A poll by the Chamber of Commerce in January showed 63% favoured adopting another currency. Public opinion is also moving: for the first time ever, a poll in April found a majority of respondents favoured joining the EU. "We are in the European Economic Space, so we already apply most EU law anyway," adds Sigurrdson. Opposition to European integration has traditionally come from the fishing lobby. But even here, the mood is changing. 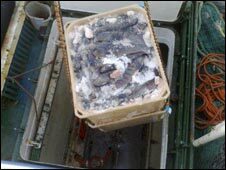 On a bitterly cold morning, with an icy wind racing in off the north Atlantic, a bright blue trawler was unloading a catch of catfish at Reykjavik harbour. "Joining the EU is the next step, we have to do it. The krona is garbage," says deckhand Adal Hallonsson, 22 years old today. "It's killing everybody here that the krona is so low. It's just a matter of time until we join the European Union. But we still need to protect our waters from foreign fishermen." Sigbjorn wants to have it both ways - and so do many in Iceland. Even senior politicians have spoken of adopting the euro without joining the EU. Brussels has made it clear this is not an option. In any case, it was hard to find anyone in Iceland who thinks the krona will exist a decade from now. And there are other signs in Iceland of the sense of crisis. This week the governor of the central bank was reported by local newspapers as calling for a national unity government to be formed to deal with the crisis - it would be the first since 1939.